The documentary Imaginary Witness really influenced my thinking on Holocaust-themed films. For most of the films, the central point was to convey the horrors of the Shoah and its effects on those killed, those who survived, and those who stood on the sides. Recently though, with television miniseries like Uprising and films like Defiance, the story is about not being passive, but being aggressive, about fighting the Nazis, not being their victims. It's a cultural shift in a barbarism less than seventy-five years old: instead of going gentle into that good night, we now learn stories of taking arms against a sea of troubles. While these stories of Jewish resistance are ones that should be told, there is a danger that in telling them, we forget to include actual people in them. Defiance (director/co-writer Edward Zwick and Clayton Frohman adapting Nechama Tec's non-fiction book Defiance: The Bielski Partisans) tells the story of the Bielski brothers. There's Zus (Liev Schriver), the hothead who wants to fight, fight, fight. There's Tuvia (Daniel Craig), more rational and perhaps compassionate, who will fight when the need arises but only then. There's Asael (Jamie Bell), a bit of a naive youngster. Technically, there's also Aron (George McKay) who is a minor and thus really is relegated to the background. It's 1941 and the Germans have overrun Belarussia, killing or capturing however many Jews they can find. The Bielskis, who have been in the forests for reasons not entirely clear (I was never sure if they were hiding or doing some sort of illegal activities) come to find their parents dead and Aron deeply traumatized. They go back to the forest, and soon they are joined by other fleeing Jews such as Tuvia's old teacher Shimon Haretz (Alan Corduer) and the intellectual Isaac Malvin (Mark Feurstein), as well as a host of others. From their hidden forest camp, the Bielskis begin a campaign of resistance against the Nazi occupation. Zus wants to fight, but Tuvia wants to survive, not go on attacks for vengeance. 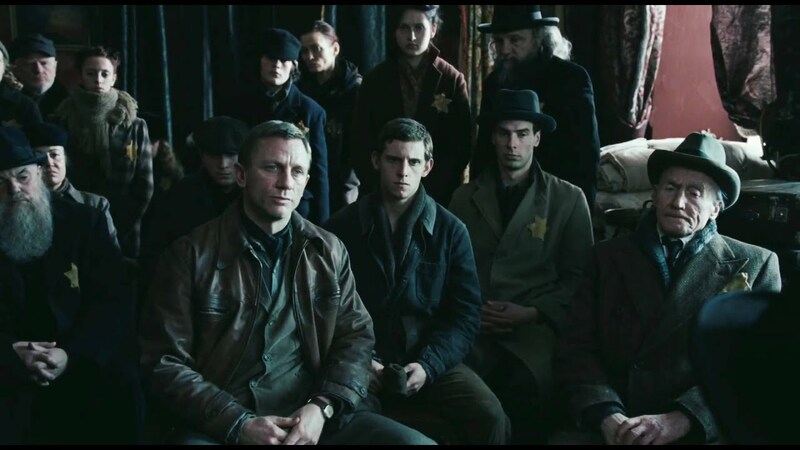 Zus, unhappy with this and Tuvia's leadership, joins the Russian partisans (despite the strain of antisemitism within the Red Army), while Tuvia does what he can to get as many Jews out of the Nazi's reach. 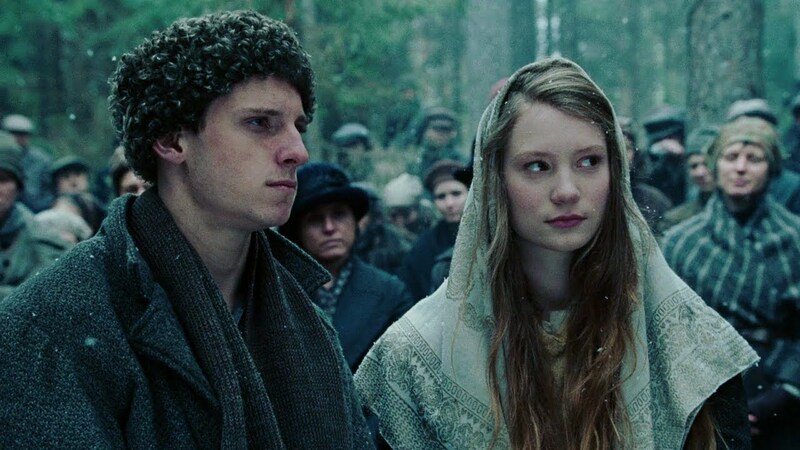 Asael, having escaped a group of Nazis, brings with him Chaya (Mia Wasikowska), the girl with whom he will fall in love. Tuvia, a bit of a loner after being widowed, finds love again, with Lilka (Alexa Davalos), and there's even a bit of romance between Zus and an equally strong woman, Tamara (Jodhi May). Eventually, Zus and Tuvia reunite and join forces against the invading Nazis. Defiance, for all its good intentions, suffers precisely because of said good intentions. The main flaw in the film is that it's too reverential to the story. The Bielski Brothers are reduced to nothing more than living stone figures: Zus the Wild One, Tuvia the Morose/Contemplative One, Asael the Emotional One. We never get to know them as individuals; on the contrary, the brothers spend so much time being "noble" and "heroic" that they never become human. The flaw of making the Bielskis into heroes rather than people essentially forced into heroism starts right at the beginning of Defiance. For all the talk the brothers made about the killing of their parents Zwick lost an opportunity to establish the family dynamic by having us see any of the Bielski family as individuals, as people. Since we never got to know their parents, we never got to fully appreciate the impact and horror of their murder. Instead, we jump right into them being orphans and having their world broken apart. The family relationship between the two oldest brothers is never fully established. In Defiance, I could only guess that Tuvia is the oldest but there was always the chance that Zus is the elder Bielski brother (the fact that Schriever is only five months older than Craig does not help sort out matters). My guess for Tuvia being the oldest is because he was the one in charge, but for those with siblings, who is to say the oldest has to be the automatic leader of the family? Why did Zus not want to take on more refugees? He never got to fully present his case, nor did see what motivated Tuvia to have a relatively compassionate heart, unless you disobeyed his orders. In fact, we never got to know anyone in Defiance. Whatever wisdom that could be drawn from Shimon or any intellectual conversations between him and Isaac the Socialist was left out. One can wonder as to who these refugees are, but in spite of its two-hour and seventeen minutes we never get any idea who any of the people are: not the Bielskis, not the refugees, not the Russian/Soviet partisans. They are anonymous refugees, and perhaps in the world of Defiance, we didn't need to know them because they weren't all that important to the goal of the film: which was canonization of the Bielskis. It is hard to believe that Zus or Tuvia could fall in love with anyone because both of them are so stiff from being noble that they don't appear to harbor any emotions common to us mere mortals. 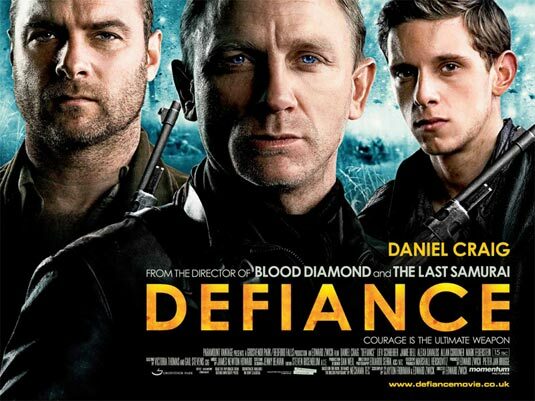 It's an unfortunate fact of the direction, in every sense of the word, Defiance took that the actors within it suffered. You have a good cast of women (in particular my not-so-secret love Wasikowska) but the woman are not strong or independent or anything really. Their job is to merely look with awe at the heroic brothers and not be their own people. You have Craig, looking all sullen and morose; in short, no different than in any of his films: has he ever smiled on camera, you have Schriever, matching him in his stiffness, you have Billy Elliot looking all lost as the Youth. We are suppose to believe there is a romance between Asael and Chaya, but since we never see them in anything close to a romantic situation, or even a passionate embrace, we can't ever accept that they are even interested in each other, let alone deeply in love. His marriage proposal falls flat because like all of Defiance, it is so reverential to the leads that it doesn't have the patience or interest in making them like you and me: fully rounded people with moments of joy and pain. The best example I can find in Defiance about how all of the people (I am loath to call them 'characters') are cardboard comes when the camp is coming close to starvation. Tuvia pets his horse (where he got on or stabled it or how he loved it if he loved it at all, we know not), and then the camp has meat. We don't know how Tuvia felt about his horse or if he has any kind of bond with him/her because we never see a moment of caring or interest in the animal. How then can we believe Tuvia made a great personal sacrifice when we never saw him bond with a person, let alone an animal? One thing that deeply troubled me about the film is The Accent Question: to use or not to use. I'm not a big fan of adopting accents when an English-speaking character is playing a non-English speaking part (which is why I didn't beat Tom Cruise up for Valkyrie). My belief is that we accept that Actor/Actress X is whatever nationality they are playing so accents are not needed. There is some leeway: you can't have someone like Matthew McConaughey speak with his Texan drawl in a film like Defiance because it would sound so laughable to hear a Belarussian Jew speak like he's from Austin. Side note: when it comes to English, the accent should match the nationality: if an Australian is playing a South African or a Welshman is playing an American or a Californian is playing a Scotsman, he/she should adopt the accent of the country his/her character's from, otherwise that too would sound laughable. In Defiance, they went one over. Rather than be satisfied with having the characters speak with Russian/Belarussian accents, they decided to have whole scenes where they spoke in Russian or Belarussian. I found this endlessly frustrating: either commit to an accent or make the film completely in that language. I figure Zwick thought it would add a greater air of authenticity to Defiance; what it added was more confusion. I kept wondering why, oh why they switch from the mother tongue to accented English. Why, Why, Why? Defiance doesn't seem to care about the Bielskis or the refugees as people because it was more interested in making them heroic versus human, down to heroic speeches. They were, and their story is one that should be told, but Defiance does all the survivors of the Bielski camp a disservice by dismissing their stories to mere footnotes in history and mummifying the Bielski Brothers into icons for veneration, not men who did incredible things at great personal risk. How people can take a fascinating story and make it rather lifeless defies explanation. There's a great quote in Defiance. "Our revenge is to live," Tuvia tells those at camp. I think that would have made a great title: Revenge Is To Live. At the very least, it would have signaled to the viewers that everyone in Defiance was an actual human being.